Natalie Bookchin is a video artist whose work explores the consequences of technologies on a range of topics such as aesthetics, labor, politics, and leisure. She also addresses the results of mass connectivity and the truths expressed about ourselves to the world with the use of images. Her artwork has taken a variety of forms – online computer games, collaborative performances and “hacktivist” interventions, interactive websites, and writing. She was a member of of the art/activist collective Rtmark and was a part of a loosely knit group of artists making something then known as “net.art”. Bookchin’s work is exhibited widely including at MoMa, LACMA, PS1, Mass MOCA, the Walker Art Center, the Pompidou Centre, MOCA Los Angeles, the Whitney Museum, the Tate, and Creative Time. She has received numerous grants and awards, including from Creative Capital, California Arts Council, the Guggenheim Foundation, the Durfee Foundation, the Rockefeller Foundation, California Community Foundation, the Daniel Langlois Foundation, a COLA Artist Fellowship, the Center for Cultural Innovation, and most recently, the MacArthur Foundation. 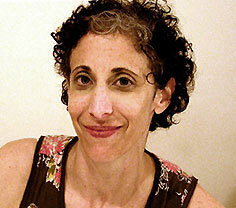 She lives in Brooklyn and teaches media art at the Mason Gross School of the Arts at Rutgers University.